Jonas- Famous Greek playwright, stage director, well known in many drama circles throughout Jerusalem. I hope you don’t mind my calling on a direct line, without going through the temple priest? I know I should go to them and to Your dwelling place, but it is just so difficult to make time to go straight to the temple and all when I want to be in Your presence. You understand? You understand everything? OH of course you do. I mean after all You being who You are…! Well I just wanted to thank you for my day today, and for my family. Yes- you are right- the day was full of blessings. Listen- I have a request- I know that things have been a little rough between you and human beings lately. I mean sin just keeps getting in the way of our relationship with you, and quite frankly, this whole sacrifice system is a bit awkward. Whenever I sacrifice an animal, I just don’t feel I have been forgiven deep down, you know what I mean? Plus the fact that it is a bit messy. And not really having full access to you, except through the temple and the priest- It just doesn’t seem to be the greatest arrangement. A coincidence, you say? How so? You DO have something new planned? Hope is on the way? Really- all this time we have been waiting for a Messiah is finally over? He’ll soon be here? What! Are you kidding me? Yes I know you tend to really MEAN what you say. You already have things pretty well worked out? Well, can I at least hear a bit about your plans? You already cast that one? With who? A BABY? A baby.... One of those real childhood prodigies or something? its just that, well, a Baby seems kind of vulnerable and all... That’s the point? Oh I see. Do you have someone in mind for the father? It’s complicated? Plot twist? I see… There’s a step Dad of sorts? Who? Yes, I know Joseph- seems a bit old for the part don’t you think? Not sure about his stage presence either. Seems a bit quiet, understated... Good family ties, eh? Part of David’s line? Well then that makes sense. Who will the mother be then? You know there’s this actress I know who can pretty much cry on cue. Not to mention she is quite attractive. The guys REALLY pay attention to her when she comes on stage, if you know what I mean. What do I mean by that comment? Oh um... nothing. Yes, I see. I will have to confess that. Sorry. So who are you casting then?- a 13 year old girl betrothed to Joseph named Mary? That’s bold, a bit unexpected... She’s related to Elizabeth isn’t she? Elizabeth has a part to play as well? Another baby you say? Hmmm. Her child, John will tell others about Messiah down the road? So he’ll probably grow up to be a governor or big leader, right? He’ll need to be someone who can make big speeches in front of the masses with a lot of power and position. Not your average guy? A bit quirky? A wanderer out in the wilderness? Camel hair coat? Will eat bugs? Well that also might attract attention, yes in an offbeat sort of way. Oh- I need to think outside the box, eh? Not what I would expect for a pregnancy? Holy? SO will she just wake up one day and suddenly find herself with child? An angel, huh? Those messengers sure come in handy. Oh Gabriel is PERFECT for that part! Excellent choice. Rugged jaw line. How will he break the news to her? He’ll just show up and tell her she has found favor with you? Why not just send Messiah down in a cloud or fly down on a golden chariot, kind of an echoing of the Prophet Elijah?? You want us to know that you know what it is like to be human? That’s nice of you. Just out of curiosity, what do you plan on naming the baby? Jesus- Oh I get it- a play on words- his name means “you save”- Great idea! Exactly what did you have in mind for a location? You know Jerusalem has a lot of great scenery. Maybe he could be born at the temple, right there in the Holy of Holies! How about that for attracting attention! I could do some real creative lighting for you and have some special effects! Something a bit more understated you say? Not going to be born at an inn? It’s just a little... well, dirty and cold don’t you think? Yes- that is true. The masses will identify with one born in such a lowly state. Wow! I never would’ve suggested any of these folks for these parts, or your location. And the story itself, seems a bit unbelievable- almost IMPOSSIBLE! That’s the point, you say? Nothing is impossible with you? That is true. So when is this all going to happen, anyway? You already sent Gabriel to deliver the message? Then things are set in motion. How exciting! I can’t wait! So how exactly will a baby messiah be our savior? A surprise ending? Not what anyone would expect? I’ll have to wait a while? No problem God. I just can’t wait to see how things unfold. Thanks so much for giving me something to hope in! Times are so difficult right now. You know, your direction is so full of surprises, so edgy- I have a story about these regular guys, a bunch of scruffy fishermen that help change the world... Do you think you could help with some direction? You already have that one in the works? No of course I don’t want to infringe upon your copyright. I understand completely. Yes. I love you too. I’ll pray with you again soon! Alright- good bye. What does today’s story from the gospel of Luke tell us? First- God does things in unexpected ways. Most producers and directors would have refused the script that God used for this event- God coming down to us in human form. No famous people or superstars- just unknowns. No big special effects- just the birth of a baby. No elaborate scenery- just a family gathered together in a barn trying to stay warm, surrounded by animals. This story then tells you and me that what we should expect in this life is the unexpected from God. This means that the things we pray for- for healing for ourselves and others, for peace in the world, for the message of the gospel to spread throughout the earth, for the poor to be fed and given shelter- all of these requests and others may be answered in unexpected ways. So I encourage you as you come to this wonderful and hectic time of year to expect the unexpected. Second-God bestows favor upon ordinary people, like you and me, and does extraordinary things. You don’t have to be a world leader or millionaire. God used a poor couple, a rag tag band of nomad shepherds, and three strangers from a far off land to tell this amazing story. This means that God can use you, an ordinary person, to do extraordinary things. You don’t have to have a seminary degree, know the Bible backwards and forwards, or even attend church every Sunday- (although it would be nice if you did) God will use us for the purposes of God’s glory, and do extraordinary things with us ordinary people. Third- Hope has come into the world, and no matter what there is always hope. We decorate the sanctuary and sing our Christmas hymns in hope-Because we remember what God has done. Advent means- coming, and God has come down to us in human form. Advent is the arrival of hope for the world in Jesus Christ. Advent is the arrival of radiant light in our darkness, hope in the midst of hopelessness. For there is always hope- hope that we can be forgiven and freed from our sins; hope that our prayers are heard and answered; hope that our God is still at work in this world and able to give us strength when needed; hope that there is a life to come ushered in by the sacrifice, resurrection and ascension of this precious Christ child; hope as we gather in worship and are empowered to serve the living God. 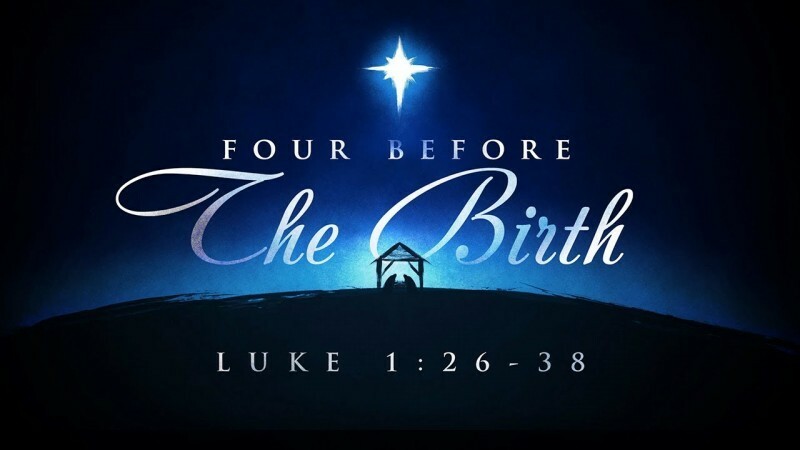 Thanks to the birth of Jesus, there is always something to hope for. May we leave here with expectant hearts full of hope, as God uses us ordinary folk in unexpected ways to do extraordinary things. Alleluia! Amen.